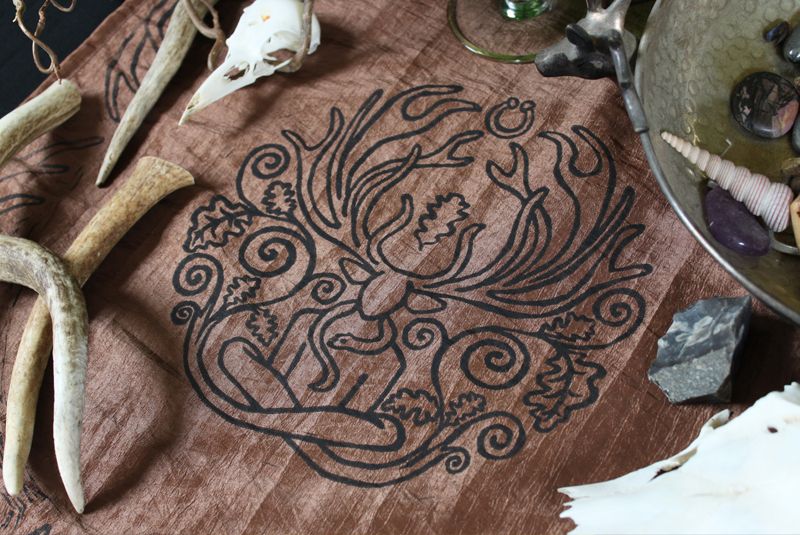 This hand printed Cernunnos Altar Cloth and other Altar Cloths are available at my Etsy Store. 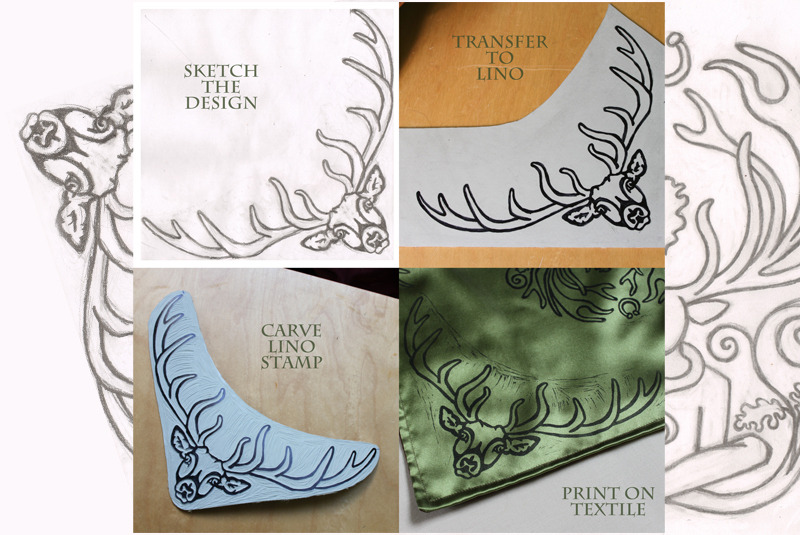 I hand printed these altar cloths with a hand carved circular Cernunnos stamp and a Stag corner piece stamp on my etching press. The last photo in the slideshow gives an overview of the creative process. 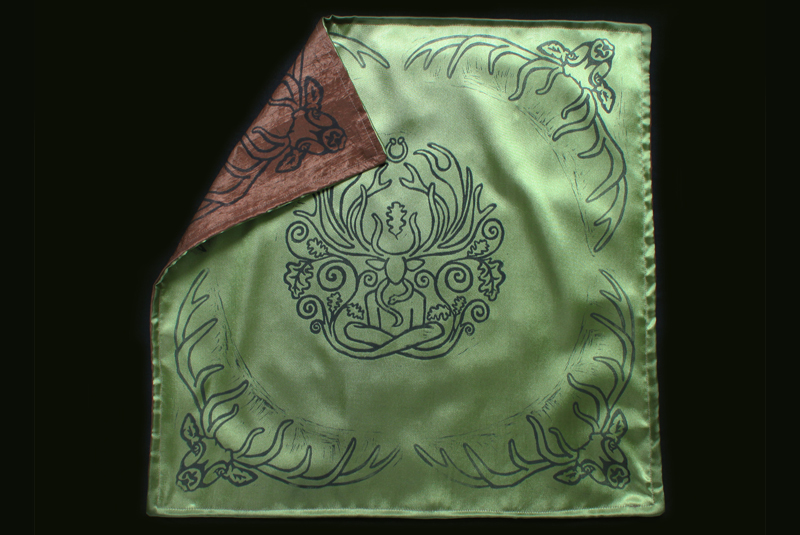 The altar cloth is double sided: shiny pale moss green coloured cloth with black print and brown taffeta with black print. 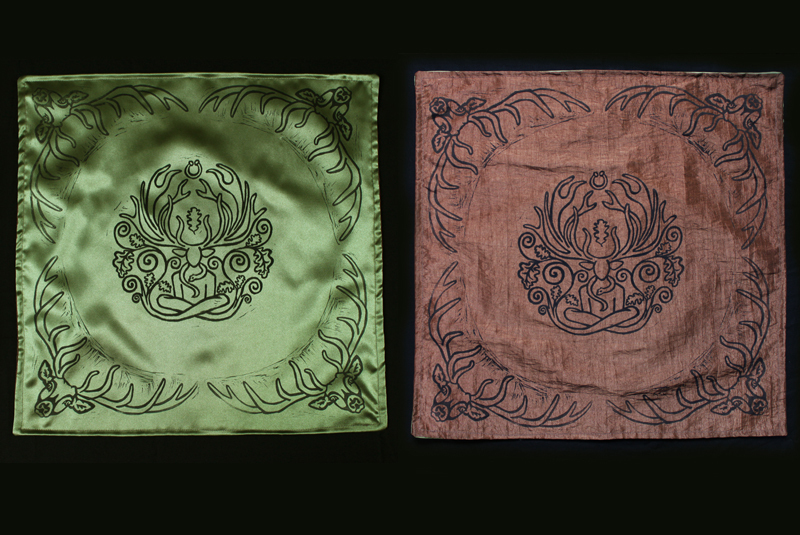 This way you get two altar cloths in one. 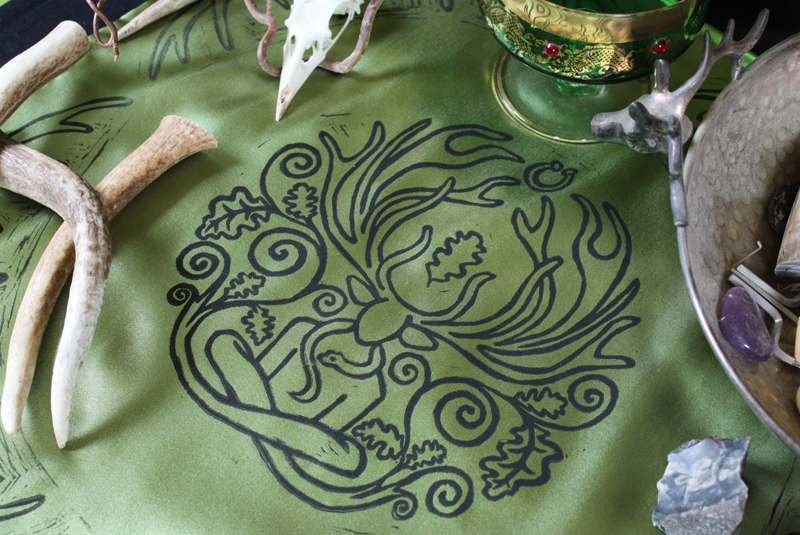 This altar cloth was inspired by the Celtic god Cernunnos. One of the most well-known images of the god was found on the Gundestrup Cauldron (a Gaulish artifact dating from the European Iron Age). He belongs to the group of gods known as Horned Gods. Traditionally Cernunnos is a fertility, forest and nature god. To me, Cernunnos is very much a representation of two important balances in life: balance between man and woman and balance between human and animal/nature. Traditionally Cernunnos is portrayed holding a torc (round Celtic necklace) in one hand and a snake in the other. Here I have placed the torc to the top of the image and the snake around his neck. These two items associated with Cernunnos can easily be associated with the male and female reproductive organs, showing that the god holds these two things in balance. This also connects to the fact that Cernunnos is a fertility god. The torc being a man-made item and the snake being a creature of nature shows the balance between man and the animal kingdom. This in turn connects to Cernunnos himself being anthropomorphic (part human and part animal) and also his title as “The Lord of the Animals”. The Horned God is often also associated as the male counterpart to the Goddess in neopagan religions.